The Professional Rodeo Cowboys Association announced the selection of the Wrangler National Finals Rodeo contract personnel. Fort Shaw’s Gary Rempel will make his 7th appearance as a pickup man, joined by Colorado’s Chase Cervi, who will be making his first appearance as a pickup man. Rempel’s first trip as NFR pickup man was in 1998. He ties Billly Ward, (WY) and Kenny Clabaugh, (WY) as the pickup man with the most selections to the NFR since the selection has been made by a vote of the cowboys. Montanan’s competing at this year’s National Finals Rodeo include reigning-World Champion Saddle Bronc rider Jesse Kruse of Great Falls, along with team roping headers Clay Tryan, Travis Tryan, and Brady Tryan, all of Billings. Roberta Sankey of Joliet will work as a timer. The 52nd Wrangler National Finals Rodeo runs December 2-11 in Las Vegas, Nevada. 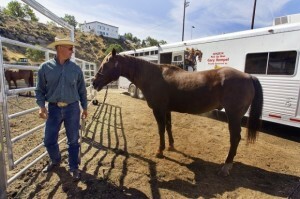 Rempel will travel to Las Vegas with six horses, including 21-year-old “Rainbow,” a legendary pickup horse that’s been on the job with Rempel since the mid 90’s. A native of Kyle, Saskatchewan, Rempel will also be making a record 13th appearance as pickup man at the Canadian Finals Rodeo in Edmonton, Alberta in November. Rempel was named “Canadian Cowboy of the Year” at last year’s Canadian Finals Rodeo. Rempel has worked just about every major rodeo in the United States and Canada including Denver, CO; San Antonio, TX; Houston, TX; Ellensburg, WA; Caldwell, ID; Puyallup, WA; the Pendleton Roundup, OR; the Calgary Stampede, Alberta; Ponoka Stampede, Alberta; and Hermiston, OR.